What happens when a bunch of mostly white 20-somethings and a union dude from Orange County hook up in movietown to get solid with a New York protest? You get OccupyLA. This is an occupation by permission. Really. 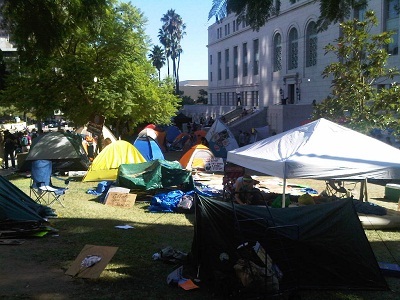 A couple hundred people camped out on the lawn of Los Angeles's City Hall after they got the permission of the Los Angeles police. It took the union dude about 24 hours to do it. In the better areas of LA, this counts as occupying something. In the rest of town, you actually have to claim some space in the name of the people and defy LAPD. But not for us. This is a LaLa Land occupation: an illusion wrapped up in a metaphor. A light image where something material and real is supposed to be. No, not that LAPD. Not the guys who swarmed MacArthur Park a few years ago on May Day in full SWAT gear (we know SWAT, it started here) to drive out the picnicking families. They knocked over some journalists on their way to shoot beanbags at the kids. Not the same LAPD that routinely confiscates cars from people who don't have documentation in a towing fees/overtime scam that the victims have no power to defy. Not the LAPD that beat Rodney King and got away with it. This movie-version LAPD gave the LA occupiers permission to pitch our tents on the lawn. Of course, the whole Occupy thing across the country is a metaphor that only sometimes touches reality, like in New York on the Brooklyn Bridge or now, as I write this, in Boston. Nowhere in the U.S. is this real like in, say, Tunisia or Bahrain. But the whole, entire message, the demands the media are demanding, are in the title: Occupy. We will take the discursive space back. Make this whole, screwed up system about natural people, not the Supreme Court created Frankenstein monster super people called corporations. Corporations eat people for lunch. Corporations also eat justice, and education, and futures—people's futures, not the Wall Street kind—for snacks. But in L.A., the metaphor reaches a whole other level of disconnect. How this came to be is as mysterious as the job of an assistant director. From the earliest clusters of a couple hundred people imitating New York's General Assembly in the nighttime glow of Pershing Square, there was never an unscripted choice. People wanted to sleep in the Square. People wanted to occupy the Los Angeles Financial District (yes, we have one). But the self-determined leaders of this leaderless movement (the people who set the agenda before the others arrived and had the answers as soon as the questions were asked) brushed off alternatives: for reasons that were never made clear, it had to be City Hall. It bothered a few people that City Hall is, well, not really the focus of the Occupy movement. It bothered a few more people that City Hall is right across the street from LAPD headquarters. Massive reflecting windows in Parker Center frame a full-sized image of City Hall, and our local cops can lob tear gas on the campers without leaving home. Los Angeles City Hall is, no doubt, one of the most secure buildings in the world. Very few people at OccupyLA seem much concerned with privacy, though. They make us move our gear from one side of City Hall to another every few day. And LAPD can turn on the sprinkler system whenever they want a giggle. LA City Hall is occupied by people who've been screwed by the system. For the most part we are young adults, under thirty, over twenty. We grew up with Reagan's philosophy of trickle, the twentieth-century permutation of noblesse oblige, the delusion that the wealthy will take care of the rest of us. We're waiting for our trickle down jobs while they were shipped overseas. Once we get those, we'll trickle back into houses. We got our trickling education and discovered we can't compete. We depended on the legal system for a trickle of justice and got state-sanctioned executions of untried citizens and innocents. We trusted our money to trickle down bailouts that stalled with bankers' bonuses. We're holding our breath for a trickle health care from the insurance companies. We wage trickling wars for no apparent reason, in what we've been promised is a world of endless, trickling wars. If we wait(/survive) long enough somebody will figure out how to save a trickle of a habitable environment. So here on the set in LA, we are camped on the City Hall lawn, and the scriptwriters tell us that if we're nice to the police, they'll be nice to us. When this started, we knew there would be affinity groups and splinter groups, variations on the theme, but we are, well, the 99%. What we weren't told was that a people's Committee on Police Brutality would be summarily shut down in the GA and their personal contact information spread around on a flyer and on the web. Nobody mentioned that the guy who spoke out against the police would be run off. He isn't part of the 1%, but for sure he's not part of the 99%, as we're told to call ourselves. He's not anywhere, really, not anyone. We are nonviolent. There's talk about signing some sort of nonviolent pledge (with the suggestion it would please the police). Nonviolence here means avoiding violence at all costs, to challenge nothing, to concede to everything. No confrontation, we will run from physical force with all our soul force. Expect no daisies in gun barrels here. No, there's no plan if the cops swarm. That wouldn't be nice. A plan for bail? Not cool. Definitely not. Civil disobedience training? So not happening here. Our Livestream chat is censored, people are banned, if the mod decides we aren't “nice” enough. The star of this streaming fantasy within the illusion is some guy who'll happily tell you what a wonderful communicator he is, a skill he learned in the Marines or the Eagle Scouts, one or the other. Being pleasant is a rule for the high point of our day, the General Assembly, with a rotation of facilitators. Not leaders, just, well, the people who decide what will be decided. They say they're the ones who've been around from the beginning, or the ones who spent the most nights, or the ones who do things. But it doesn't matter much: if you're not a committee chair, you can talk in the last fifteen minutes before the cops make us move the tents onto the sidewalk. The rest of the time is twinkling to decisions that are reported out of committees, or playing follow the leader and making pyramids over our heads when it's time to shut someone down. Wanna stop the whole operation? Bring half a dozen friends and cross your arms in front of your face to block whatever's being decided. If they can't convince you, you win. Honest. We have an absolute rule against drugs and alcohol. Our self-appointed security team, more concerned with protecting us from each other than from any outside threat, will bust you. You can trust security to stop you from getting too loud during a march, too. We're told all this is real democracy, and if you're sitting comfortably watching the screen, it looks for all the world like it is. The grand illusion is nearly perfect. But if you look close, its the props that don't quite work. How did the finance committee get a business checking account? How are they managing to hand out not just blankets, but tents to everyone who asks? Where did the matching notebooks in the media tent come from, or the media tent, or the fully equipped medical tent? How, in just a week, is this occupation feeding everyone, not just occupiers, but everyone who comes by? One answer snuck out today: LAPD is sending in supplies, including sunscreen to protect the Occupiers from the California sun. Some people are refusing to eat the food. No lie. The storyline here is that this is a horizontal structure, without leaders, left to us the people to control. We are controlled, our set, who our characters are, what we do and what we say. We are free agents only within the illusion of the script. We have busted out of the illusory world of lives determined by corporations, of corporations, and for corporations, and escaped into a made-for-TV illusion of freedom. Such is the start of the new world, the post-corporate people's democracy. How did that happen?